Progress on the restoration of the church is slow but continuing. Most recently, one of the original front double doors was repaired and painted. 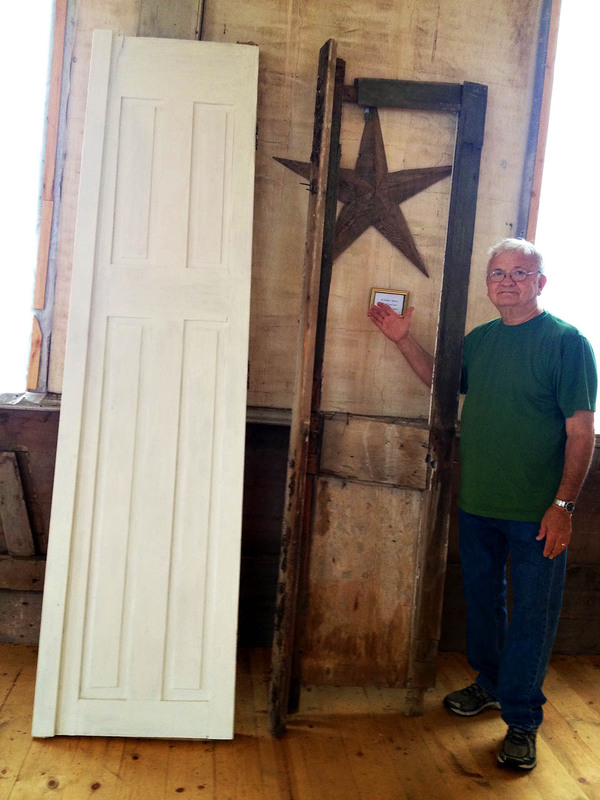 Larry Yanke, of Delavan, had one of the front doors repaired and he painted the door. Thank you, Larry, for your generous contribution. Pictured next to Larry is the other front door which is now being repaired. 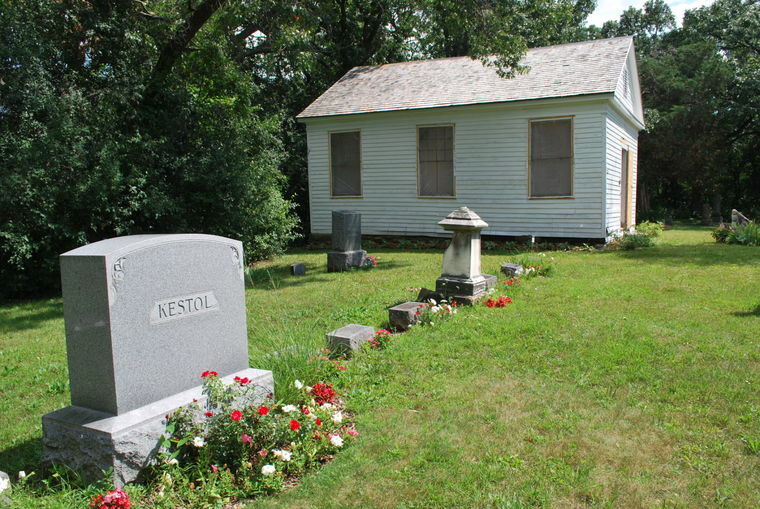 EAST RICHMOND — Adjacent to the East Richmond Cemetery along Walworth County Highway P outside of Whitewater, is the Norwegian American Methodist Episcopal Church and East Richmond Cemetery. The church originally was built in the early 1850s, and now it is being restored. Georgia Kestol-Bauer’s great- grand parents were Norwegian immigrants to Wisconsin in the early 19th Century. Peder and Anna Kjostolsen eventually Anglicized their name to Kestol. Posted: Monday, August 18, 2014 9:25 am | Updated: 9:31 am, Mon Aug 18, 2014. RICHMOND — A few miles south of the City of Whitewater, near Whitewater Lake in the Town of Richmond, you might — just might — catch a glimpse of a white roof between the lush summer leaves on the wooded bluff. If you’re not driving by too quickly, that’s it. That glimpse actually is a view of one of the best-kept secrets in this region’s history, for sitting atop the bluff, at N7273 Walworth County Highway P, are the Norwegian American Methodist Episcopal Church and East Richmond Cemetery. 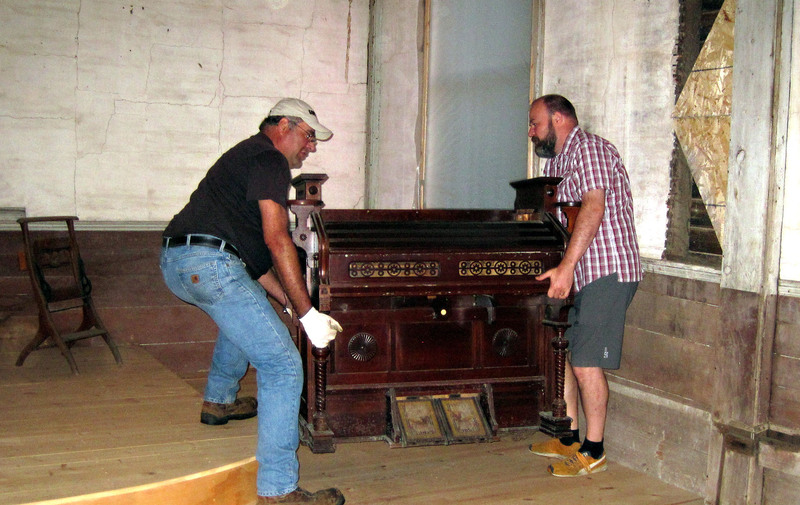 The church originally was built in the early 1850s, and now after decades of abandonment and neglect, one of the descendents of the church’s founders has made it her mission to restore and recondition the former place of worship. Georgia Kestol-Bauer’s great- grandparents were Norwegian immigrants to Wisconsin in the early 19th Century. Peder and Anna Kjostolsen (who would Anglicize their name to Kestol) were one of five Norwegian families, about 32 people in all, who relocated to the Richmond area. One of the other immigrants, Christopher Steeson, donated part of his farmland so the church could be built there. Kestol-Bauer and her supporters will be holding a public open house from 1 to 4 p.m. on Sunday, Aug. 24, so folks can see how far the church’s rejuvenation has come along, and how much still needs to be accomplished to fully restore the former house of worship. The Norwegian American Methodist Episcopal Church in Richmond is only the second church in the state of that particular denomination. The first one is Willerup United Methodist Church in Cambridge, named after the Rev. Christian Willerup, a circuit rider who served as pastor of the congregations. 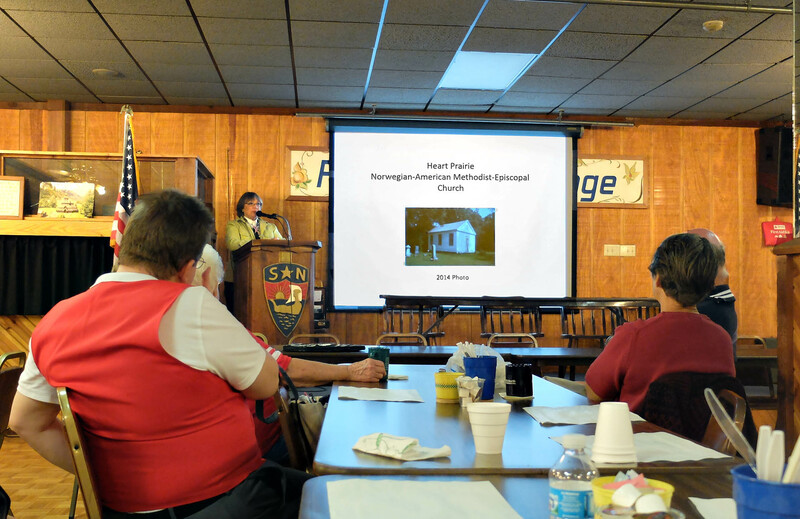 Kestol-Bauer explained that while the Richmond-based building fell into disrepair, the adjacent East Richmond Cemetery has been maintained by the township. There are both new and century-old graves on the grounds. 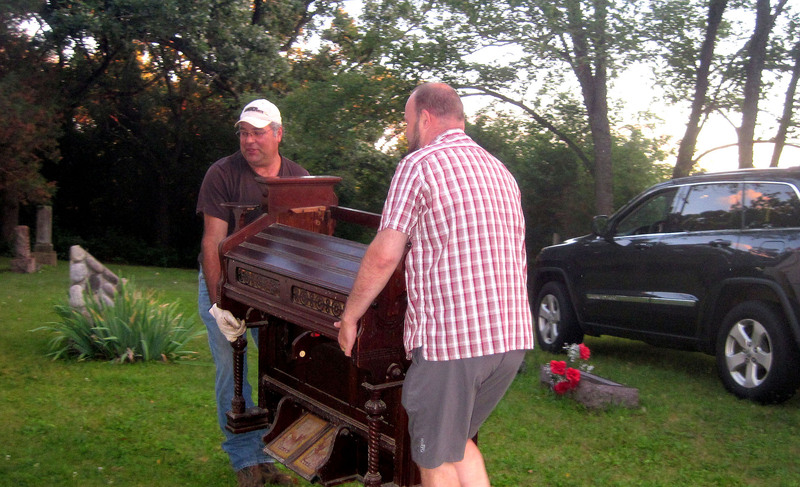 In fact, Kestol-Bauer organized the Walworth County Cemetery Association, and that group recently held its annual meeting in the partially-refurbished Norwegian American Methodist Episcopal Church. “The last association was formed in 1907, but that one just stopped after a while,” Kestol-Bauer said. It was her love of family history that prompted Kestol-Bauer to pursue the project. She added that in 1992, her family had a historical plaque installed just outside the church to remind people of the church’s past. “Over the years, my dad and cousins would occasionally put on a new roof or repaint the church,” Kestol-Bauer recalled. However, much more needed to be done. Last fall, a contractor told her that the walls, ceiling and floor had to be stabilized to keep the building from collapsing in on itself. In fact, the Town of Richmond Board of Supervisors was considering tearing down the structure for safety reasons before Kestol-Bauer undertook the reconstruction process. A new wooden cross has been donated for the altar area, and a classic Estey Organ has been donated to the church, as well. Other items, such as framed family letters (including one from a relative who fought in the Civil War, writing about Lincoln’s assassination), congregational letters written in Norwegian, and Daguerreotype-styled photos of early church ministers are hanging on the walls. The church still needs new windows, new paint, a proper step at the entrance, new front doors and some work on the walls. The altar area has been restored, but railings are needed. Beams and tension wires were added to the space between the ceiling and rooftop to help with stabilization. The pews, 10 in all, have been removed, but the supporting boards, attached to the interior walls, remain visible. Square-headed nails in the wall likely held oil lamps at one time, she noted. Kestol-Bauer said that two interior support beams might not necessarily be fully restored because they have their own history. It seems apparent that after in the church was abandoned completely, likely in the 1920s — the members dispersed to other congregations — the structure became a place for generations of teenagers to hang out and do teenager-like things without parental supervision. In fact, some of the graffiti, mostly names and hearts with initials carved into the wood, clearly date back to at least 1967. Kestol-Bauer said she has sought donations for the church’s restoration, but she personally has borne most of the cost. 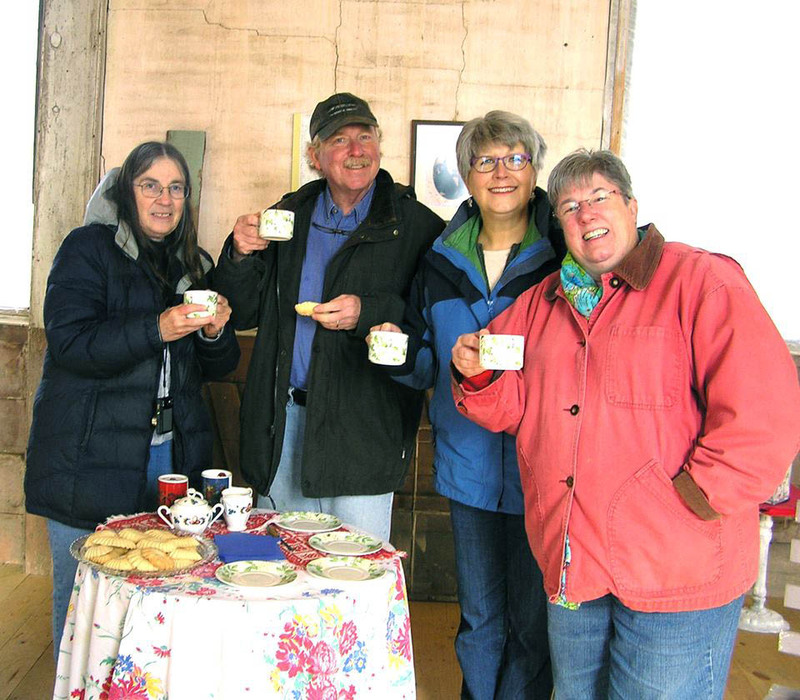 She hopes the open house on Aug. 24 might generate more interest and more volunteers to help on the project, although that is not the sole goal of the event. Kestol-Bauer said she envisions the restored church as meeting or gathering place. While a lot of the details about the church have been lost through the ages, Kestol-Bauer still has at least two “minister books” that give some historical clues about the congregation. early congregants’ names, baptisms and funerals are listed in the hand-written tomes. The first entry is dated 1852, written in Norwegian, with later entries in English. Kestol-Bauer’s’ Great-Uncle James’ birth is listed in one of the books. There are also names that have been crossed out, indicating that members left the Richmond church for other congregations or, as listed in some cases, journeyed farther westward to other states. That might have referred to the Rev. Christopher Steenson and his son, the Rev. Steen Steenson, who became a missionary to Norway. The church represents a fascinating history of the Norwegian immigrants who settled in Richmond more than a century-and-a-half ago. The open house will be held from 1 to 4 p.m. on Sunday, Aug. 24, at the Norwegian American Methodist Episcopal Church and East Richmond Cemetery, located at N7273 County Highway P.
From Whitewater, take East Milwaukee Street to U.S. Highway 12. Cross Highway 12 and continue on Highway P. From Interstate 90, take the State Highway 59 exit 163 toward Milton/Edgerton. Turn right on East State Road 59, left on County Highway N, right onto Highway 12/89 and then right onto Highway P.
For more information about the history of the church, cemetery, and restoration efforts, visit a website created by Georgia’s daughter, Allison Kestol-Bauer and Charles Cottle at https://namech.org/.